With it's left engine feathered, the C-90 King Air flares for touch-down at KCGI. The pilot was able to taxi to our parking ramp using the planes's left engine. 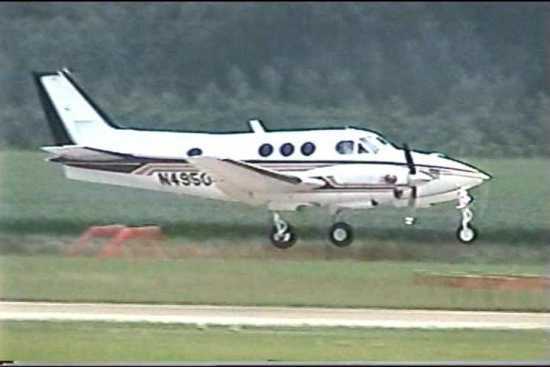 KCGI got an un-expected visitor yesterday, when a C-90 King Air dropped in after suffering an engine failure at cruise. The pilot said he suspected that the right engine had lost a turbine blade after it's temparature jumped, followed by an immediate loss of power. He shut down the engine, and was directed to Cape, where he made a normal landing, and taxied to the ramp on his good engine. The passengers visited with us until they were later picked up by a Citation Jet, dispatched by the owners of the King Air, and continued on to their original destination.